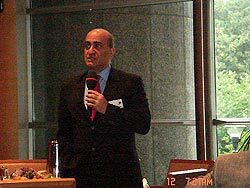 "For a popular Presidential election: Disarm militias, reform Taef, adopt a Federal system"
In an interview with Voice of Lebanon "Sawt Lebanon" from Washington DC, Dr Walid Phares, an advisor to members of the US Congress and the Co-Secretary General of the Transatlantic Group on Counter Terrorism (TAG) said "there are three conditions to transform the Presidential election in Lebanon from the Parliament to a direct popular suffrage." Phares, the author of The Coming Revolution: Struggle for Freedom in the Middle East said "first there should be a disarming of all militias, including Hezbollah and the Jihadists. There cannot be direct popular elections while entire areas of Lebanon are dominated by armed militias. Hence the removal of these weapons and the deployment of the Lebanese Army and security forces across the territory is a first unavoidable condition. Second, an institutional change of this dimension should prompt a revision of the latest political agreement which oversees the political and constitutional mechanisms of this republic. The Taef agreement will have to be revised and restructured. Moving from Parliamentary election of the President to a popular suffrage needs a reform of the Taef agreement. And the third condition, which should precede such massive change, is the establishment of a federal system in the country. For the initial sectarian distribution and the election via a sectarian Parliament was designed to reflect a pluralist representation of the public. It was a bad one already. Electing a President whose office is supposed to represent one community by all citizens will complicate the situation further. Thus a federal system should be installed to address once and for all the issue of community representation, then all posts could be open to all citizens." Phares said "once there is a federal system, and militias are disarmed, there would be no problem to have the President elected directly by the people, and I would even add, there should not be a problem to have the President and all other posts from different communities. For local Governments will ensure representation of the communities and the federal institutions will insure the national accord." He concluded: "a popular election by the people, is not an overnight adventure it is a transformational matter. If it has to be done, everything else has to be redone"